Is An Off-road Hoverboard Worth It? The short answer is 'yes it's worth it! These off-road or all-terrain hoverboards are much more powerful and sturdy than their lightweight cousins. Let me start by saying that I am no hoverboard maestro. In fact, I’m quite the novice when it comes to riding these things. As anyone who has tried will attest, a hoverboard is something that requires a bit of practice to ride easily. I think that’s why kids like them so much. Hoverboards are cool, and they require a bit of skill to use. You can’t just walk up to one and start riding it. That level of skill gives hoverboards an air of exclusivity to the kids that can look cool and ride them. 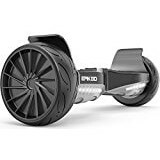 Most regular small-sized hoverboards have a 250 watt motor on each wheel which is pretty powerful. These regular boards can only really travel on the smoothest of surfaces and that usually means a sidewalk or concrete street surface. So what happens when you need more firepower for off-roading? What should a more powerful Hoverboard look like? Well, this manufacturer has increased the power of each wheels motor to 350 watts. 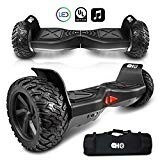 This hoverboard is a beast, it’s the Hummer or Hoverboards and you can take it on most terrain including beaches, dry sand, gravel, grass and more. I know, I’ve tried it. That said, I do have a few caveats which I will explain below but these may be more to do with my novice rider status than the limitations of the off-road hoverboard itself. First off, let’s take a tour of the machine itself, because it’s surprisingly simple on the outside. The first thing I noticed is that it’s really heavy. There is a waterproof bag in the box which has strong straps for carrying when you’re not riding, but this is not one of those toy hoverboards that you can sling over your shoulder on a strap. This one is really heavy. Goodness knows what’s inside it but it feels like it’s made of lead. I can lift it out of the trunk of the car but I wouldn’t want to carry this machine for any great distance. In any case it’s not designed to be carried, is it? It’s designed to be ridden all over the place and on any terrain. 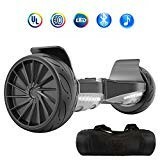 The next thing that I noticed is that the outer casing is made of that unbreakable poly-plastic, which is a good thing because I came off this hoverboard a few times while in motion and the board is so powerful that it crashed to a halt without me, using its high fenders to help it come to a halt. For this reason I would recommend getting some kind of Fender protection to use while you are learning, otherwise your fenders will get scratched up a bit like mine did. It’s also very obvious that the fenders are very high off the wheels, unlike the toy hoverboards. There is no chance of any debris from the forest floor or wherever you are riding becoming caught up in the wheel arch. This is a good thing because it also makes room for the massive tires! 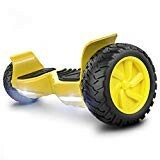 These tires are again much larger that you will find on a toy hoverboard and the tread is much deeper, allowing for some grip even on a wet surface. 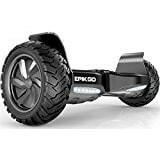 Here are my selected 10 best off-road hoverboards. These models provide the best value for money along with features. The model I bought and describe in this article was a non-branded generic board very similar to a few of the branded models below, as you can see from the wheel design and the fender shape. The manufacturer says that this off-road hoverboard is waterproof. I would be a little more cautious than that and say it’s water resistant. I wouldn’t throw it into the pool and expect it to work again, but I would take it out in light rain or on a wet surface. It looks to me like all the internal components would be well protected from rain or water splashing up from the floor, but dunking the entire thing in water would probably be a foolish thing to do! That said, there are some metal discs exposed on the inner side of each wheel. They look like steel discs (but what do I know?) I would give these a good wipe down after using the hoverboard in wet conditions to prevent rust. It may turn out that these discs are aluminum but I like to err on the side of caution and look after my kit so it’s lasts a long time. There are no external controls on this off-road beast other than a metal power button that you need to keep pressed for about 5 seconds. This is next to the charging port that is used with the supplied cable and charging unit at the rear of the ‘board. This sturdy off-roader is fitted with bright white front lights as well as red rear lights. The lights only come on when you are actually moving. I guess this saves the battery a little. As you stand on the board in motion you notice that each side has a row of 3 small green LED lights. These lights indicate which side of the board is turning and also the battery charge state. There really is nothing to it. You just switch it on and go. No fancy controls to learn and no complicated movements to get used to. You literally step on it with both feet, lean on your toes to move forwards and lean on your heels to slow down and stop. Shift your weight to your right foot and you will circle to the left, shift your weight to the left foot and you will circle right. I found controlling the off-road hoverboard to be very intuitive and easy to understand, not something I expected. However, there is more to it than that: the balancing while in motion part! I will explain more below. It’s worth reiterating that this Hoverboard is not toy at all. There is nothing toy-like about it. In fact, it’s not even a standard Hummer, it’s one of those full-on enormous military Hummers! This is a powerful and strong piece of machinery. I don’t doubt that it will hurt you if you don’t spend some time practicing how to use it properly before you get too adventurous. I’ll talk about my initial excursions below and you can see the videos I made while riding it. I’m a heavy-ish middle-aged guy and not the nimblest person out there, so perhaps it’s more difficult for me than the more athletic types amongst you. But please heed my warnings. Become proficient and confident on this machine before you take it out at speed or on tricky terrain. Baby steps! 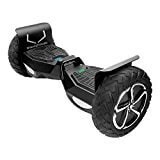 The user guide does say that this hoverboard hasa smartphone app. I have downloaded it from the app store but never bothered to use it. Apparently, you can change between 3 drive modes and check the charging status with the app. As none of this was very interesting to me because the hoverboard is already in max-mode when first switched on, I wasn't concerned about changing toan easier drive mode. Also the charger unit has a handy indicator light that goes green when it's fully charged, so no need for the app at all. So you already know that I was brand new to riding hoverboards, never mind a big powerful one like this. I was more than a little nervous and excited. Especially as I didn’t want to look foolish in front of my 14 year old son, I thought it best to wear gloves and a bike helmet to protect my aging noggin. I also decided to take it to a park that has wide and long smooth concrete walkways running through it. This would minimize the risk of damaging myself or a passer-by. The plan worked in as much as I was able to ride around the hoverboard in a fairly short space of time and didn’t actually fall off, more like ‘stepped-off’. When I lost balance I stepped of the front of the board but the board kept going and bashed into my heels a few times. For this reason I would recommend wearing ankle boots of some kind as you learn to protect the back of your ankle from being bashed like mine. Because of the nature of riding this board i.e. you need to shift your weight from toes to heel and right foot to left foot in a very subtle way, it would be easier to ride with flexible shoes or sneakers. However, that rear ankle protection is also essential. Maybe next time I’ll try using soccer shin-guards stuffed down the back of my socks! I’m not kidding, this hummer-board is heavy and powerful and hurts if it hits the back of your ankle. That said I didn’t leave the park with a limp or any damage, it just hurts. I’m just saying so that you can take precautions to avoid the pain. Anyway, that’s why you read reviews, to learn about all these little details, right? 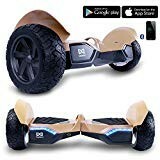 Even though hoverboard have some sort of Gyro mechanism inside them, so they can self-balance, that doesn’t mean that the person on top of the board can also balance! The board itself balances very well but you have to learn to trust it. It will stay upright and go as fast as you want if you lean forward, onto your toes. The problems I had during these initial outing were because for the board to work well, you need to evenly distribute your weight on both feet while traveling forwards. This becomes tricky when you go over bumpy ground, so I would recommend becoming an expert on flat ground before off-roading. Once you get the hang of it you will be able to instinctively shift your weight as you go over bumps and different terrain and still keep moving forward. That was the biggest problem I found as a novice. The weight-shifts required are very subtle and too nuanced for me right now. After a few hours practice I’m pretty good at riding on a flat surface as you will see in the videos I made. Off-roading, however will take a lot more practice. Isn’t that part of the fun? It's been a while since I first wrote this review and it's probably 12 months after I actually bought it. This means I now have a lot of experience using the hoverboard for an extended period of time. The good news is that we have been using this off-road hoverboard for many months now and it still seems in perfect working order. the battery charges up fine, it still goes for a couple of hours of continuous riding and although it's a little worse for wear it all works well. I have used this hoverboard in dry, wet, muddy and bumpy off-road conditions and it's a really solid machine. I really have not treated this board with kid gloves at all. It's had a few hard knocks and been used in all-weather conditions and it's still fine. As I have used the board in all conditions, it has naturally got covered in mud from time to time. In the manual, they do advise not using a pressure washer to clean it. I guess this is because it's only water resistant to the IPX4 standard and not 100% waterproof. It seems fine when the ground is wet but spraying it with a pressure washer would get moisture deep into the electronics, which is not what you want. Those batteries are powerful 42 volt 1.5 Amp units and would explode if water got tot the terminals! That said, I scrape off the muf with a plastic knife and use a damp cloth to wipe of the rest of the dust and dirt. I have noticed that, for some reason, Murphy Oil Soap cleans up the hard plastic parts really well. It's worth cleaning the inside of the carry-bag as well. I tend to put the hoverboard straight into the carry-bag when it's muddy just to get it home, and then clean up both at home. Be sure to take a damp board out of the bag as soon as you get home because leaving it damp in the bag would cause some internal corrosion to the working parts. This is probably the best part of the whole off-road experience and it took me a while to get to. Mainly because these Hoverkarts where not available when I first bought the hoverboard, at least I didn't know about them. So here is the deal with the Hoverkart: they are the best thing to happen to hoverboards - ever! The Hoverkart attachment has brought a whole lease of life to the Hoverboard. Hoverboards are great but if you're like me, they are a little hard to ride and difficult to use, even with a lot of practice there is a limited amount of use I can get out them. The Hoverkart completely changes that. For those who don't know, a hoverkart is a seated metal-frame kart attachment that straps onto the hoverboard in such a way that the hoverboard becomes the rear wheels of the hoverkart. The hoverkart frame itself has a single front wheel attached. This picture can describe it better. 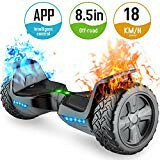 The net result of using a hoverkart is that you suddenly now have a 3-wheel electric go kart which is just as maneuverable as the original hoverboard. For me, a large part of the hoverboards appeal is it's maneuverability. The fact you can turn on a dime and stop and reverse in a split second is the most exciting part of riding a hoverboard. Now with a Hover kart attachment you get to enjoy all of that while sitting down on the kart. No concerns about falling off the hoverboard anymore! The hoverkart has been made all the more fun because of the off-road nature of the hoverboard. In my view these two are the dream team. So now we kart off-road with the off-road hoverboard and hover kart combination, but more about that in the full hover kart review. Thanks for reading, I hope this was helpful and encourages you to buy an off-road hover kart rather than a regular less-powerful model. Let me know if you have any questions. It's hard not to love the Hummer verions of the hoverboard. Great for off-roading especially when combine with a hover kart attachment!